Enjoy a healthier body with the benefits fennel seeds have to offer, ranging from Weight loss to helping prevent Cancer it’s all for you. Fennel (Foeniculum vulgare) is a plant belonging to the Parsley Family along with Dill, Cumin, Caraway, Carrots, Celery, Coriander, Parsnip and Parsley to name a few. The whole plant is edible from the bulb to the seeds of the flowering plant. Fennel is popular around the whole in particular Europe and across India. In fact, India is currently the biggest producer of Fennel and its seeds. There are two options when growing Fennel. For those who wish to use and gain the most from the leaves then you would cut the flower heads. For those who wish to use the seeds, allow the flower heads to grow and the seeds to ripen once collected you can then gain the greatest amount of fennel seed benefits. Above you will find that 100 grams of Fennel Seed contain a high amount of Minerals. Fennel seeds are also very high in Vitamins such as Thiamine, Riboflavin, Niacin along with Vitamins B6, and C.
Not bad for such a small seed. Fennel essential oils can help promote healthy digestion, respiratory function and help to reduce blood pressure. The many health benefits below can be used in the form of Fennel Seeds or bulb. Many of the properties found in the seeds can be found in the essential oil. However, the oil is in its purest and most potent form and can be the most beneficial. There are many properties Fennel Essential Oil has such as being an Anti-inflammatory, Antiseptic, Astringent, Digestive, Diuretic, and Expectorant amongst others. Potassium is one of the major minerals required in the body and vital to the health of the blood cells. Fennel seeds are high in potassium and if you compare to another food rich in potassium. You will find that potassium is also lost in the cooking process. Fennel can be cooked but is mostly used in salads, or the seeds can be eaten raw. Unfortunately, a lot of potassium can also be lost from excessive sweating, diarrhoea, vomiting, use of laxatives and diuretic medications. In the United States alone, it is estimated that one in five people who are hospitalized have low potassium levels which can be a concern. This is why Fennel either as a bulb, Seed or Essential Oil along with proper dietary maintenance and care of the body can be of great benefit. 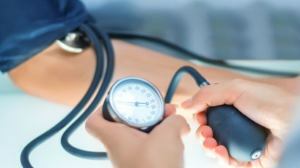 Potassium is also valuable in helping to lower high blood pressure which can be a significant risk factor for heart attack or stroke victims. It also helps to stimulate the kidneys in eliminating wastes via the passing of urine. 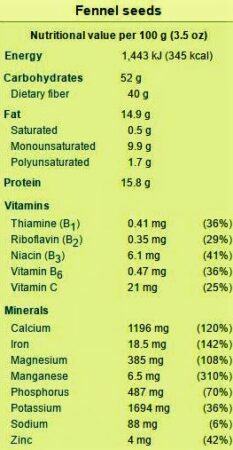 As Fennel has a higher level of dietary fibre (refer to the chart above) this can help to lower cholesterol levels in the blood. It is helpful in removing potentially carcinogenic toxins from the intestines and fight against colon cancer. Fennel helps to reduce appetite allowing you to feel fuller for longer thereby helping with weight management. Fennel seed extract can inhibit the growth of tumours and also protect against harmful effects of radiation during cancer treatment. Fennel has anti-cancer properties that can also stop show cancer cells from growing. It can also help to remove carcinogenic toxins from the colon. Fennel works well as a diuretic and because it is able to help stimulate kidney function, the kidney is better able to flush out excess fluids and toxins from the body. This can also help reduce risks or any urinary tract problems as well as relieving and stopping water retention build-up. This is of great benefit to those wishing to lose weight. This is of great benefit to those wishing to lose weight. 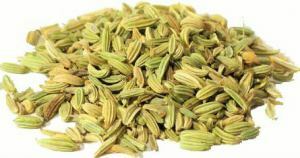 Chewing on some Fennel Seeds can help to sweeten and refresh the breath due to its antibacterial properties. The anti-inflammatory properties help to assist in soothing gum infections and to soothe sore gums. Another option is to gargle with tea made from fennel which can also help to reduce or stop bad breath. Due to its calmative actions, fennel seeds are able to relieve many digestive issues such as bloating, flatulence, intestinal gas even preventing gas build up. Due to these beneficial actions, Fennel and its fibre content are able to help prevent constipation and Loosening up stools thus promoting regularity within the digestive tract. Emmenagogues stimulate blood flow and one action of this is that it can help to stimulate and regulate menstruation. This is beneficial in particular those who may suffer from hormonal disorders or light or infrequent menses. Fennel Seeds have phytoestrogens which help issues such as PNS (Premenstrual syndrome) menopausal issues and breast swelling or enlargement. Consult a qualified health professional should one be pregnant or if menstruation has slowed or ceased for any unknown reasons. As an expectorant, Fennel seed is beneficial for respiratory issues such as bronchitis, cough, colds, flu, chest, and nasal congestion due to the presence of Cineole. Taking the seeds can also help to break up and loosen phlegm along with helping to eliminate from the body. This can aid in a quicker recovery. 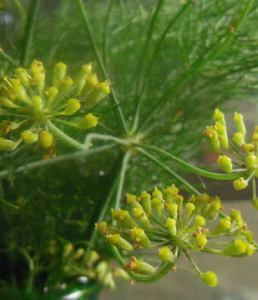 Have you used Fennel Essential Oils or benefited from the Fennel Seeds? Why not drop a comment below and let us know how it benefited you or someone you know.